Fantasy Flight Games continues their X-Wing Miniatures Game previews with the venerable Y-Wing expansion pack. The versatile and reliable BTL-A4 Y-wing was the Rebellion’s primary starfighter until the arrival of the T-65 X-wing, and long after it was scheduled to be phased out, its speed, durability, and weapon options helped it remain a staple of the Rebel fleet. The Y-Wing Expansion Pack contains one detailed Y-wing miniature, its maneuver dial, four ship cards, five upgrade cards, and all requisite tokens. 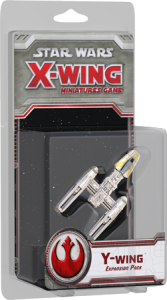 These give you everything you need to bring the Y-wing into your games of X-Wing, as well as a wide range of options for balancing your piloting skill and the tactical advantages and potency of your upgrades.